The Answers for Kids Bible Curriculum combines three popular illustrated “kits” (Beginnings, Seven C’s of History, and Questions) into an all-in-one 30-lesson course designed to greatly strengthen the biblical foundations of children's lives. 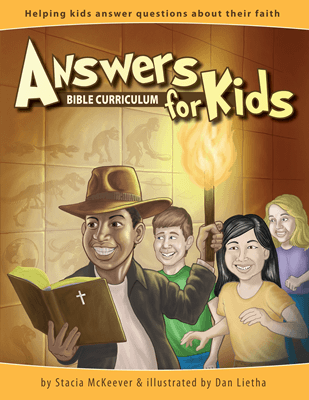 The Answers for Kids Bible Curriculum combines three popular illustrated “kits” (Beginnings, Seven C’s of History, and Questions) into an all-in-one 30-lesson course designed to greatly strengthen the biblical foundations of children’s lives. 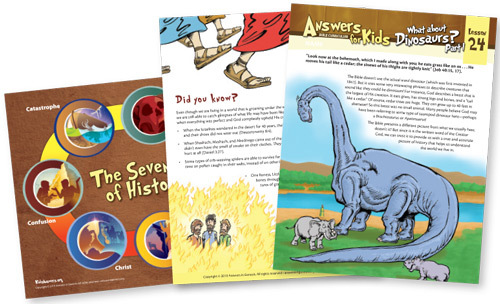 Perfect for Sunday school, homeschool, Bible clubs, Christian school, or family devotions, this dynamic curriculum gives children a solid understanding of biblical history and helps them to boldly share and defend the truth of the gospel. 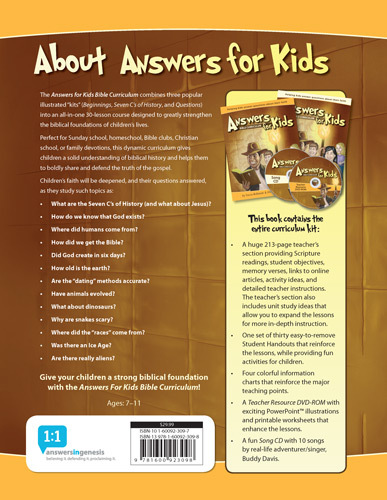 A huge 213-page teacher’s section providing Scripture readings, student objectives, memory verses, links to online articles activity ideas, and detailed teacher instructions. The teacher’s section also includes unit study ideas that allow you to expand the lessons for more in-depth instruction. One set of thirty easy-to-remove Student Handouts that reinforce the lessons, while providing fun activities for children. A Teacher Resource DVD-ROM with exciting PowerPoint™ illustrations and printable worksheets that enhance the lessons. A fun Song CD with 10 songs by real-life adventurer/singer, Buddy Davis. —Marry Ellen J., Harbour, N.J.